Love them or hate them the Kea is one of the most memorable bird species you may meet in New Zealand. This large olive green mountain parrot will greet you with a loud keee-aa before proceeding to make a nuisance of himself. Well known for his playful antics, the kea just loves to rip the rubber lining off car windows, steal boots from outside tramping huts and jump round on hut roofs in the middle of the night. Anything to get attention and relieve the boredom of everyday life in the mountains. The kea’s range is confined to the South Island and they are generally seen in high alpine basins but have been seen on river flats and at sea level. They are sometimes confused with their close relative the kaka, which is a more colourful bird. The exact size of the wild population is unknown but is estimated to be 1,000-5,000 birds. They feed predominantly on berries and shoots however they have been known to fossick through rubbish bins and have been accused of killing sheep. Their curious nature helps them find food in their harsh environment. Keas are the only members of the parrot family that are polygamous, with males often having more than 1 female incubating eggs within his territory. They nest in high altitude forests, under logs, in holes in the ground and in gaps between large boulders. Two to four eggs are laid during the breeding season of July to January. The eggs hatch 3-4 weeks later and the chicks fledge at 13-14 weeks of age. 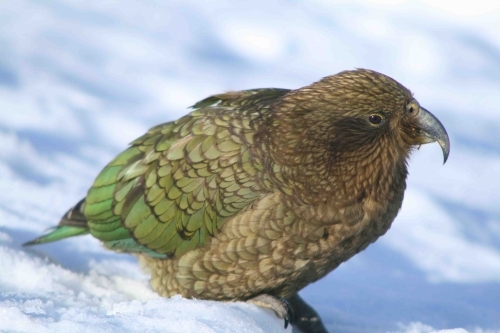 Kea are a fully protected species and are rated as one of the most intelligent birds in the world. They are often seen in large groups in popular tourist spots in alpine areas. Trouble is usually caused by only a few in the group while the others stand back and enjoy the show. In these areas you will see large DO NOT FEED THE KEA signs. This is because supplementing their food gives them more time to cause trouble as they don’t need to spend time seeking out their own low energy food sources.